So, 2017 saw the last Spring Budget, and the Autumn Budget will take place on Wednesday 22 November 2017. 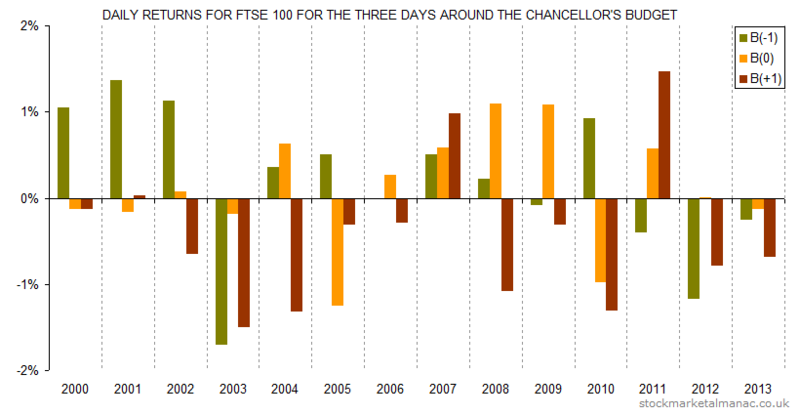 The following chart plots the daily returns for the FTSE 100 Index for the three days around Budget Day for the years 2000-2017. 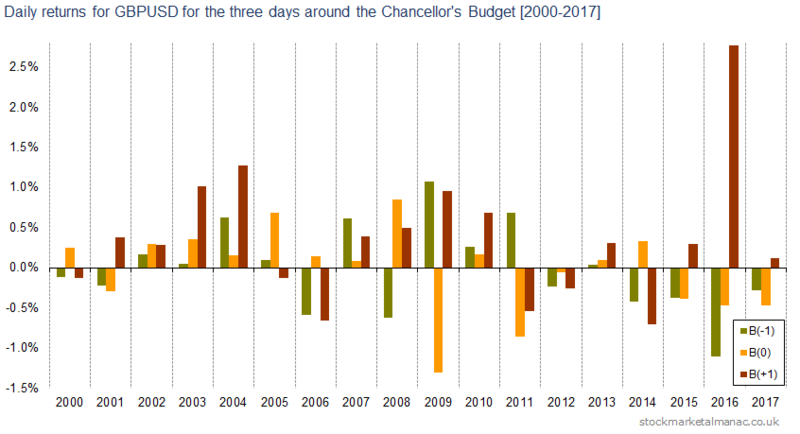 For example, in year 2000 the Budget was on 21 March, the day before the Budget the FTSE 100 rose 1.04%, on Budget Day the index fell 0.13%, and on the day after the index fell 0.12%. 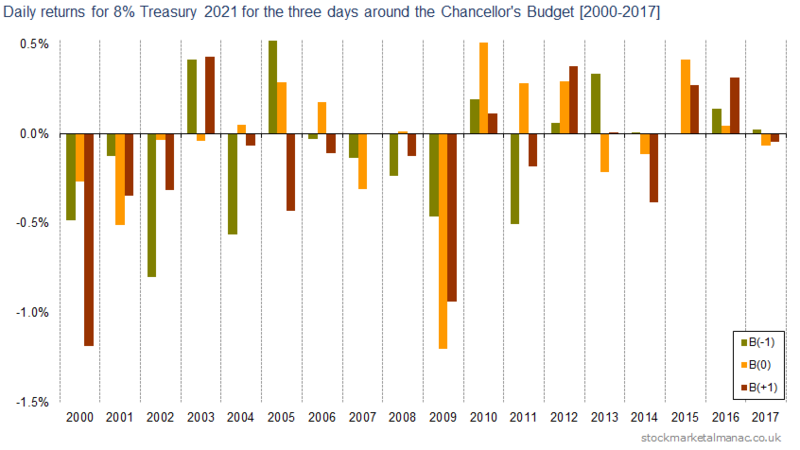 Similar to the above, the following chart plots the daily returns of GBPUSD around Budget Day from year 2000. And, finally, the performance of gilts (the 8% Treasury 2021 is taken as a representative gilt) around the budget. 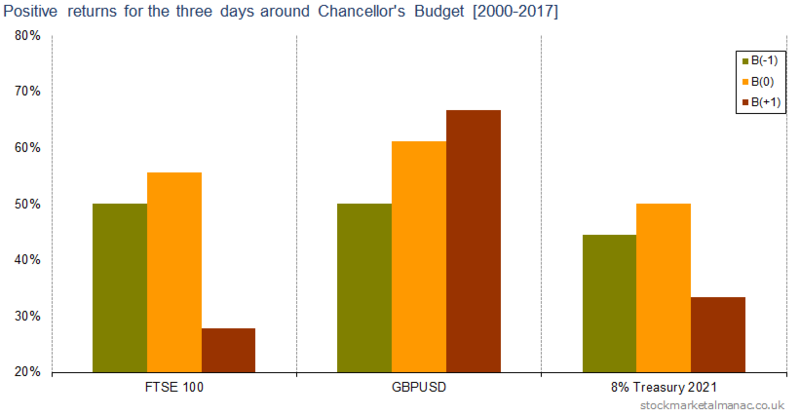 The following chart shows the average returns for the period 2000-2017 for each respective asset class for the three days around the Budget. 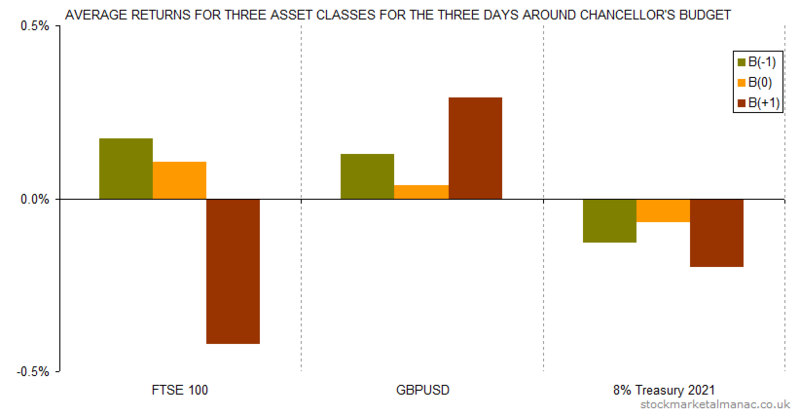 And the following chart shows the proportion of positive returns for the three asset classes in three days around the Budget. On average since 2000 the equity market has seen mildly positive daily returns on the day before the Budget and on Budget Day itself. But the most significant observation is that equities have been weak on the day after the budget. 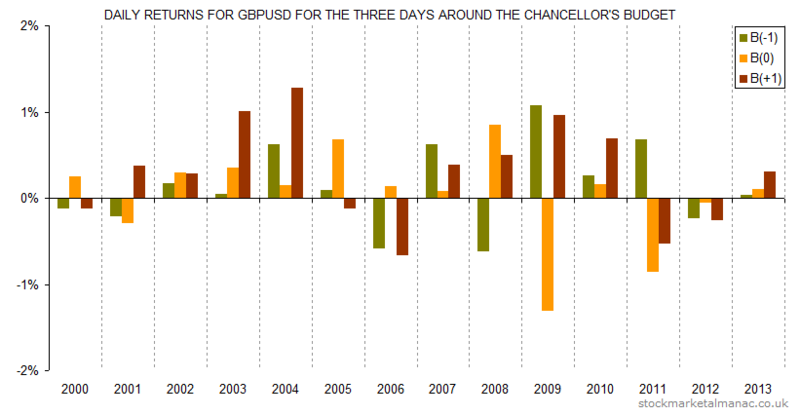 On average the pound against the dollar has seen little change on the day before the Budget and on Budget Day itself, but has been strong on the day after the budget. While, on average, gilts have been weak for all three days, with the weakest day being the day after the Budget. 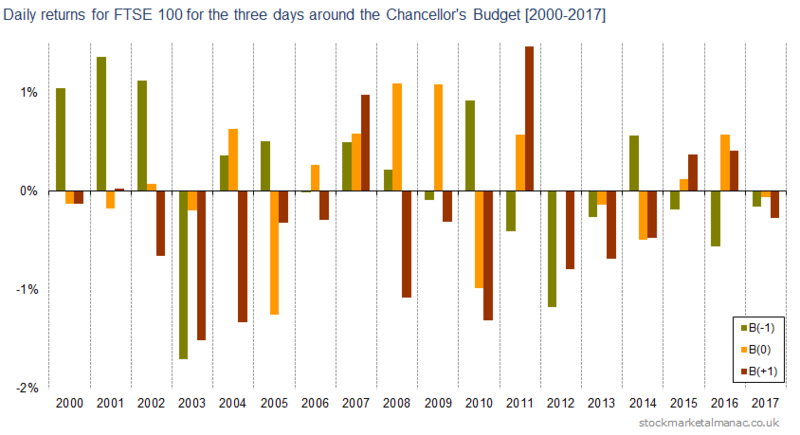 The United Kingdom Budget Day used to be in April, after the start of the fiscal year, but these days it is in March, before the end of the fiscal year. The Chancellor of the Exchequer will give his Budget to Parliament this Wednesday, 19 March 2014. 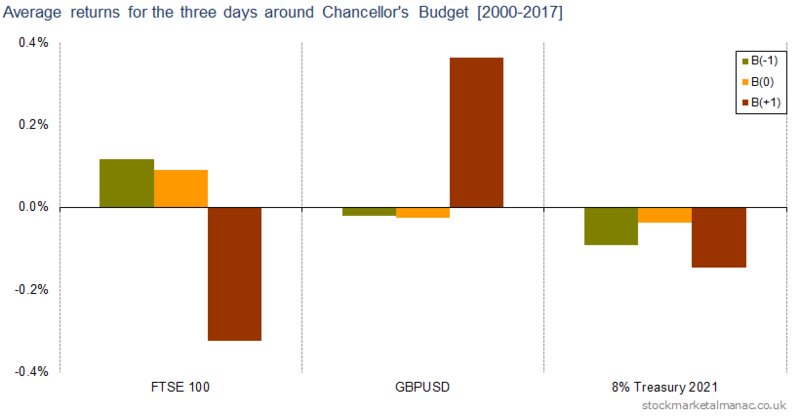 For example, in year 2000 the Budget was on 21 March, the day before the Budget the FTSE 100 rose 1.04%, on Budget Day the index fell 0.13%, and on the day after the index fell 0.12%. The following two charts give a summary for the three asset classes. On average since 2000 the equity market has seen mildly positive daily returns on the day before the Budget and on Budget Day itself. 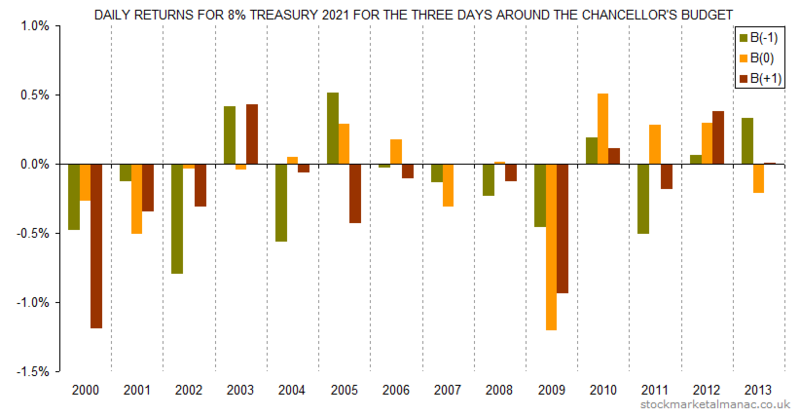 But the most significant observation is that equities have been weak on the day after the budget – since 2000 the market has only risen on three days after the Budget. 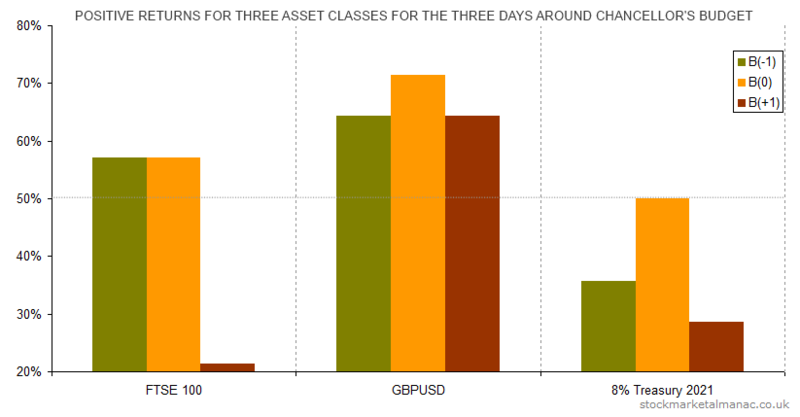 Sterling seems to like the Budget, on average GBPUSD has risen for all three days. Gilts have been weak for all three days, with the weakest day being the day after the Budget.